ExtremeXOS 22.5.1 is now available! describes added support in sFlow for "New data structures to support reporting on hardware/table utilization statistics." The feature is available on Summit X450-G2, X460-G2, X670-G2, X770, and ExtremeSwitching X440-G2, X870, X620, X690 series switches. Figure 1 shows the packet processing pipeline of a Broadcom ASIC. The pipeline consists of a number of linked hardware tables providing bridging, routing, access control list (ACL), and ECMP forwarding group functions. Operations teams need to be able to proactively monitor table utilizations in order to avoid performance problems associated with table exhaustion. 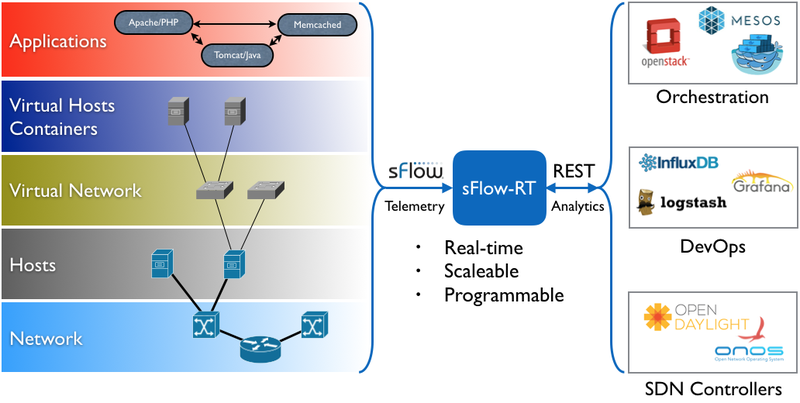 Broadcom's sFlow specification, sFlow Broadcom Switch ASIC Table Utilization Structures, leverages the industry standard sFlow protocol to offer scaleable, multi-vendor, network wide visibility into the utilization of these hardware tables. The sflowtool output is useful for troubleshooting and is easy to parse with scripts. Leaf and spine fabrics are challenging to monitor. The fabric spreads traffic across all the switches and links in order to maximize bandwidth. Unlike traditional hierarchical network designs, where a small number of links can be monitored to provide visibility, a leaf and spine network has no special links or switches where running CLI commands or attaching a probe would provide visibility. Even if it were possible to attach probes, the effective bandwidth of a leaf and spine network can be as high as a Petabit/second, well beyond the capabilities of current generation monitoring tools. Fabric View solves the visibility challenge by using the industry standard sFlow instrumentation built into data center switches. Fabric View represents the fabric as if it were a single large chassis switch, treating each leaf switch as a line card and the spine switches as the backplane. The result is an intuitive tool that is easily understood by anyone familiar with traditional networks. Access the web interface on port 8008. The first chart shows the largest TCP/UDP flows traversing the fabric (calculated from a continues stream of packet samples received from all the switches in the fabric). The chart updates every second, providing a real-time view of traffic crossing the fabric. 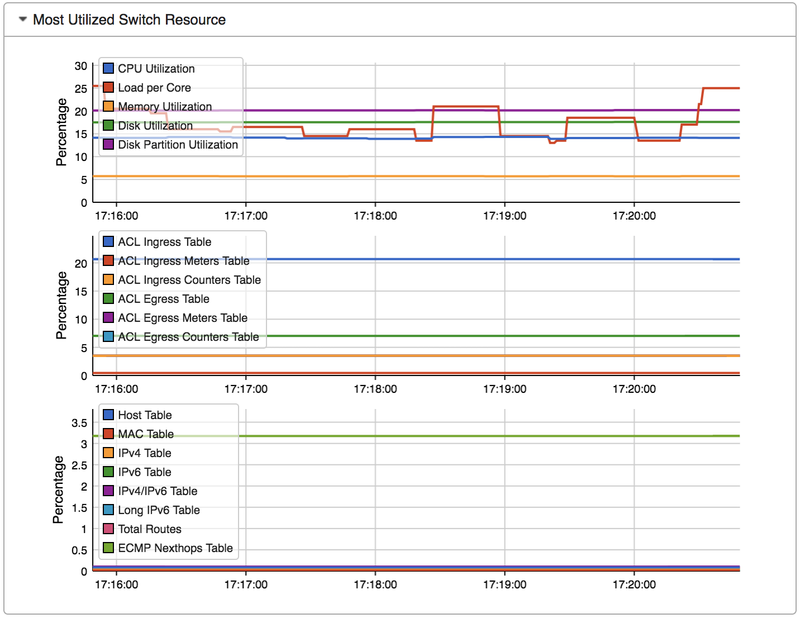 The last two charts are based on the hardware/table utilization statistics that are now implemented in ExtremeXOS, trending the maximum utilization of each table across all the switches in the fabric. FabricView is one of a number of applications developed for sFlow-RT. Examples include: DDoS mitigation, Internet routing using top of rack switches, and other articles on this blog.